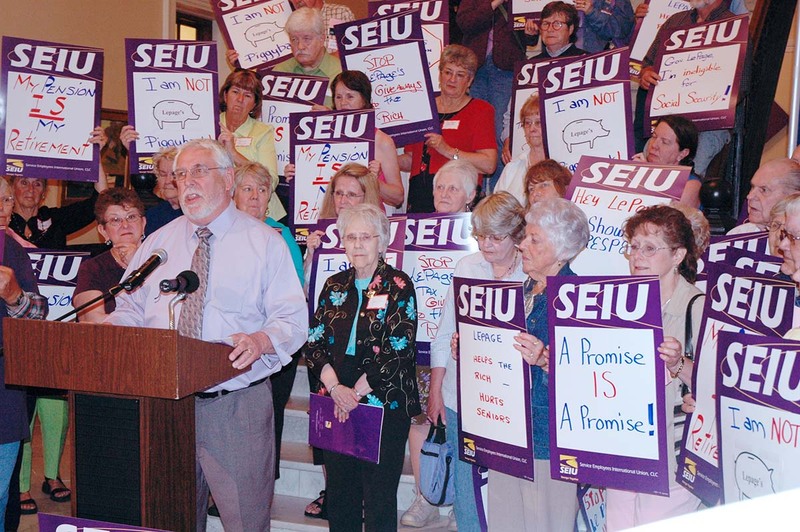 Back in 2011, MSEA-SEIU retiree members and others rallied for pension fairness. On April 1, 2019, we testified in support of legislation known as LD 1104, An Act to Clarify and Protect Certain Public Service Retirement Benefits. On April 1, we testified in support of legislation known as LD 1104, An Act to Clarify and Protect Certain Public Service Retirement Benefits, sponsored by State Rep. Michelle Dunphy. LD 1104 establishes the state and teacher retiree cost of living adjustment in statute as a solemn contractual commitment, protected under the contract clauses of both the Maine and U.S. Constitutions. This is an issue of fairness. For many state and teacher retirees who dedicated their working careers to serving Maine people, their pension from the Maine Public Employees Retirement System is their primary, in many cases their sole, source of income in retirement. Many state and teacher retirees do not collect Social Security; if they do, it is a minimal amount. For most of them, their pension is their Social Security. Some of you may recall the 125th Maine Legislature imposed enormous pension cuts July 1, 2011. Those cuts included: increasing the retirement age to 65 for state workers and retired teachers who had less than five years of service as of July 1, 2011; freezing the cost of living adjustment (COLA) to retiree pensions for three years (2011, 2012 and 2013); and capping the COLA to retiree pensions to up to 3 percent, based on the cost of living adjustment, of the first $20,000 of pension income. Those cuts put retired state workers and teachers behind the cost of living, and none has been able to catch up with the cost of living since then. Please help current and future retired state workers and teachers catch up with the cost of living in retirement by establishing the state and teacher retiree COLA in statute as a solemn contractual commitment, protected under the contract clauses of both the Maine and U.S. Constitutions. Please support LD 1104. Thank you and I would be glad to answer any questions. Read our full testimony here.